The item Annie quinn in america, Mical Schneider, (electronic resource) represents a specific, individual, material embodiment of a distinct intellectual or artistic creation found in Austin Public Library. 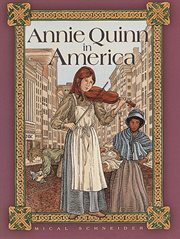 Annie Quinn knows the only way to survive the potato famine is to leave Ireland. With her younger brother Thomas, Annie must leave her mother and home behind. Annie's adventures are only beginning..